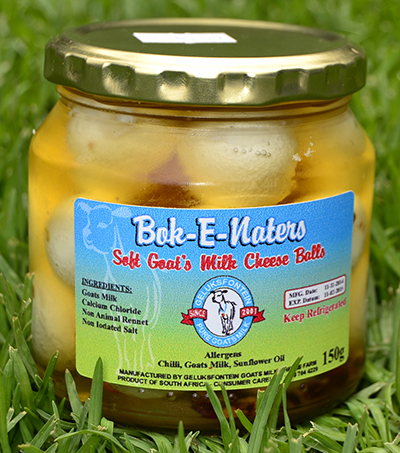 Welcome to an authentic Cheese Farm in the Heart of the Waterberg! Geluksfontein is located in the Waterberg Area. 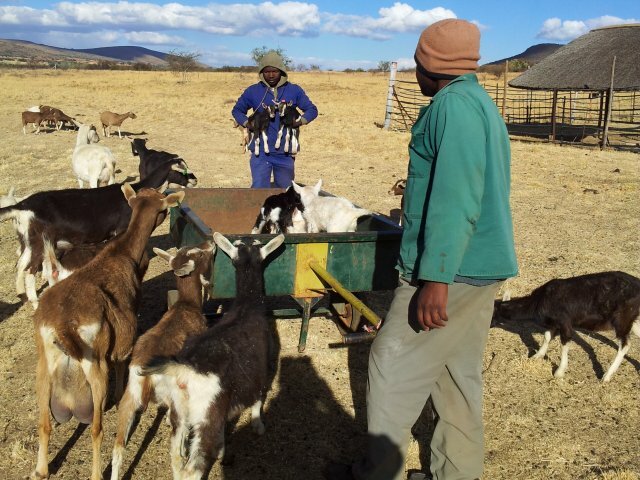 Our goats are reared on natural grazing in this pollution free area. Besides for rearing livestock, the area is also known for crop and fruit produce. We specialise in cheese and milk production. Our goat milk cheeses are made in the traditional way, using milk produced by our Swiss-Type goats reared on the farm. Cheese is made daily, using only milk low in butterfat content, ranging from 2.5% to 3.25%. Cheese also have less than 1% salt content. Goats' milk cheese is thus very healthy. Individual cheeses are formed in traditional moulds brought in from Kwa Zulu Natal, and, are double wax-coated to preserve flavour and to ensure a long shelf life. Various different cheeses are made, full details are available on the product page. - Goat Milk Soap, Cottage Cheese, Halloumi and Fudge! 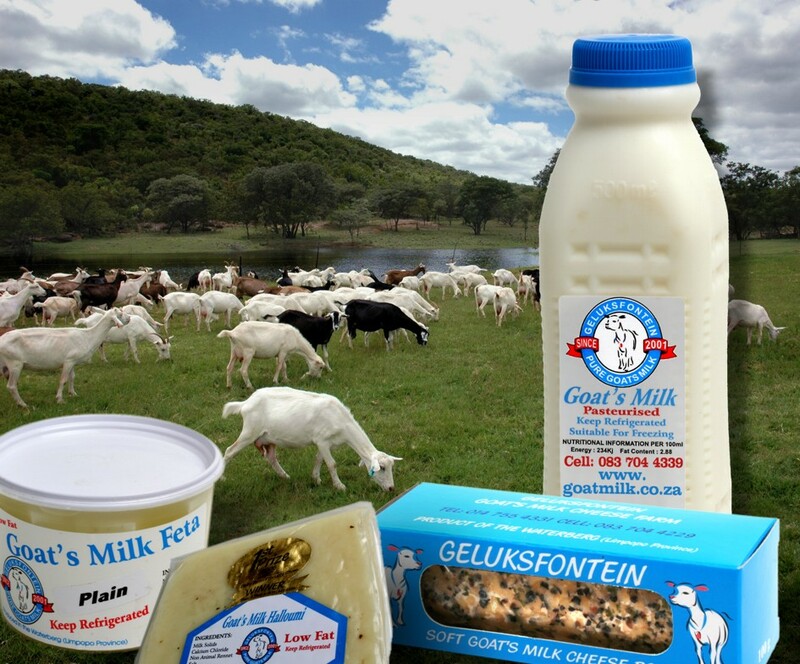 Geluksfontein dairy goat's comprises a 400 acre dairy goat farm in the Waterberg region of the Limpopo province. It is 30 km from Modimolle (Nylstroom), 30 km from Vaalwater and approximately 2½ hours from the city of Pretoria. Worldwide more people drink goat's milk than milk from any other animal, which account for an estimated 4.8 million tons of goat's milk annually. Goat's milk is non-allergic as it does not contain the protein b-lactoglobulin, which is the main stimulant of allergenic reactions. 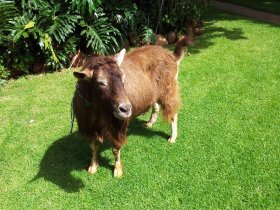 Goat's milk also has a higher acid buffering capacity than cow's milk. For newborns, higher levels of glycerol ethers in goat's milk seem to be important for nutrition. It would appear that naturally homogenized goat's milk is a safer alternative to the mechanically processed cow's milk, because there is very little absorption of the enzyme xanthine oxidase. This enzyme is released during the mechanical processing of cow's milk and has been linked to scar damage to the heart and arteries on entering the blood stream. This damage, in turn, stimulates the bodies release of cholesterol, laying a protective fatty material on scars, which causes arteriosclerosis.